Maybe the term sick isn't the proper one, maybe a glutton for punishment would be more like it. The reason I say this is that the recent rekindling of the Serial Numbered Insanity project has me wanting to do another one. I've always enjoyed hockey cards just as much, if not more than baseball cards. When I sit and think about it, it's surprising that I didn't start this project with hockey instead. So, I've toyed with a couple of ideas for a hockey themed serial numbered insanity set. 1. There's 30 teams in the NHL right now, similar to MLB. I could easily do the same thing and collect 50 cards from each of the 30 franchises. 2. I've also thought about doing the entire set focused on just the Maple Leafs. Overkill? Possibly, but I'd enjoy every minute of the chase. The big difference I would do this time is I wouldn't restrict myself to one card maker. I left Upper Deck out of the first serial numbered challenge; my thoughts this time lean toward opening up the challenge to all card companies (if I decide to do this). My heart really wants to do this, but the financial/practical side says that I should be finishing up some of my vintage sets before I start this. I'm going to take a bit of time and think about this, probably waiting until I finish up with the house purchase (which hopefully is complete by the first week of August). Meanwhile, let's keep the baseball set moving along and show off pages 7 & 8 today. #58: Orlando Hudson, 2006 Topps gold parallel #58/2006. Courtesy of Jim from the GCRL blog (retired). Toronto card #1. #59: Brett Sinkbeil, 2011 Topps blue diamond parallel #59/60. Courtesy of Ryan from the This Card is Cool blog. Florida card #2. #61: Kyle Drabek, 2011 Topps Chrome sepia parallel #61/99. Courtesy of Kyle from the Just a Bit Outside blog (removed). Toronto card #2. #62: Carlos Quentin, 2011 Topps gold parallel #62/2011. Courtesy of Ryan from the This Card is Cool blog. Chicago White Sox card #2. #63: Carlos Lee, 2011 Topps Triple Threads #63/1350. Courtesy of Max from the Starting Nine blog. Houston card #3. #64: Skip Schumaker, 2008 Topps Heritage chrome refractor #64/599. Courtesy of Kyle from the Just a Bit Outside blog (removed). St. Louis card #6. 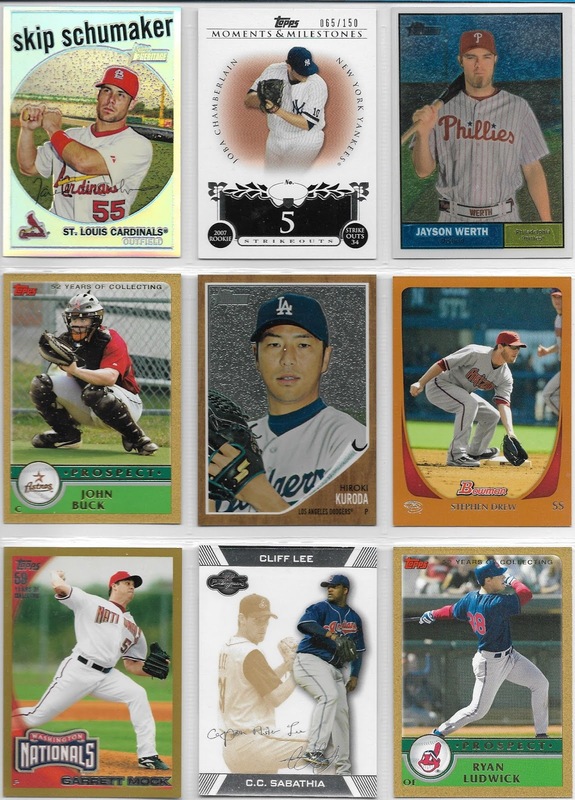 #66: Jayson Werth, 2010 Topps Heritage chrome #66/1961. Courtesy of Michael from Nomo's Sushi Platter blog. Philadelphia card #3. #67: John Buck, 2003 Topps gold parallel #67/2003. Purchased from the Sandlot Cards website. Houston card #4. 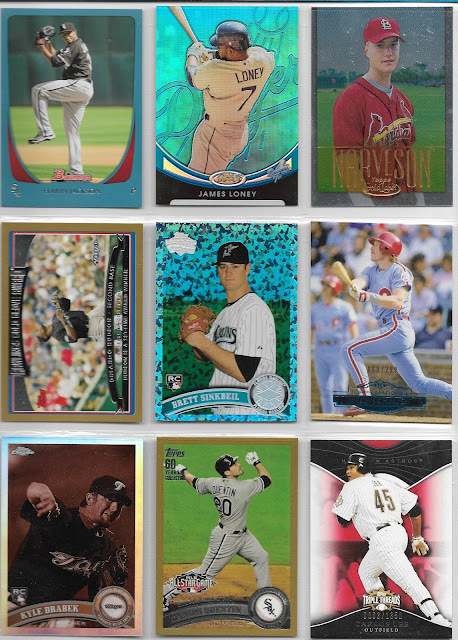 #72: Ryan Ludwick, 2003 Topps gold parallel #72/2003. Purchased from the Sandlot Cards website.